Do I Need a Facelift, Neck Lift, or Both? Signs of aging can affect both the face and the neck. These two areas can age at the same or different rates and in similar or different ways. While some individuals are candidates for just one of these rejuvenation procedures, many are candidates for both facelift and neck lift surgery. Depending on your rejuvenation goals and the signs of aging you have, these procedures can help you achieve a youthful and revitalized appearance. 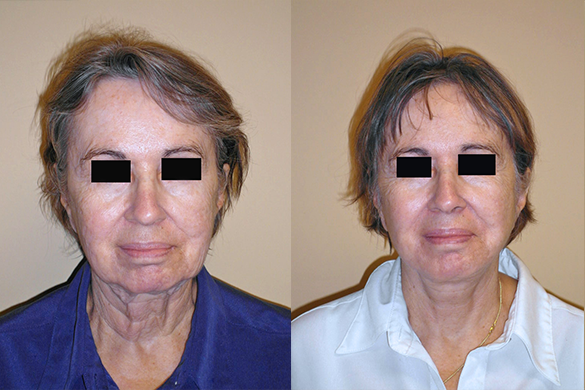 A facelift may be recommended for individuals with signs of aging in the lower face and along the jawline. On its own, this procedure corrects sagging skin in the cheeks, drooping tissues in the lower face, and wrinkles in the lower face. A facelift also minimizes fat accumulation under the chin (a double chin) and may reduce some wrinkles in the neck area. This procedure improves lower face and jawline definition. Who Needs a Neck Lift? A neck lift may be recommended for patients with signs of aging in the neck. These can include pockets of stubborn fat (such as a double chin), vertical neck muscle banding (commonly called a “turkey wattle”), wrinkles on the neck, and sagging skin below the jawline. Surgically attending to this area redefines the neck line and can help the face look more youthful as well. In fact, a neck lift is formally known as a “lower rhytidectomy” or “lower facelift” because of how closely these two areas are tied together. Who Could Benefit From a Combined Facelift and Neck Lift? Many patients would benefit from undergoing these two procedures together. Those with sagging skin, wrinkles, and fat deposits in the lower face as well as vertical bands, fat deposits, sagging skin, and wrinkles in the neck can look years younger after a facelift with neck lift. These two procedures complement each other admirably and considerably enhance face and jawline definition. The results of trimming excess skin and fat from the neck line can also help candidates look slimmer as well as younger. If you have additional questions about facelift and neck lift surgery, please contact us to request your free consultation with our board-certified plastic surgeon, Dr. Michael Jazayeri. Dr. Jazayeri can help you determine which rejuvenation procedure is best for you. Call (714) 834-0101 or complete our online contact form to schedule your consultation today.